New York's Industrial Labor Commissioner Frances Perkins during a visit to Philadelphia, PA, February 17, 1932. 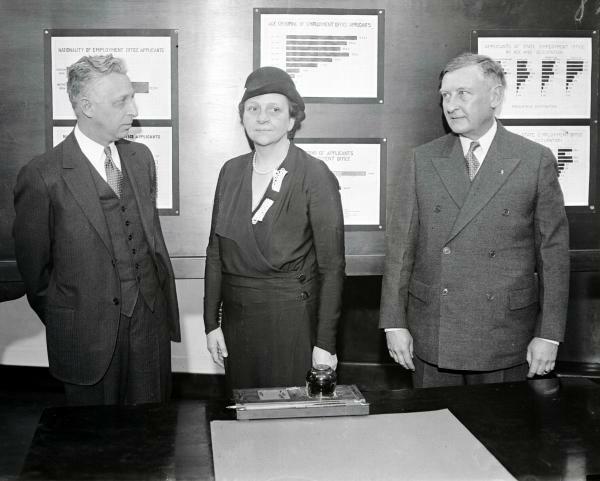 When Frances Perkins gave a speech to the Pennsylvania State Employment Commission in February, 1932, it was already expected that she would soon become the nation's Secretary of Labor, and the first woman to hold a cabinet post. With her in this picture are Richard Neustadt (left), director of the Pennsylvania Employment Commission, and Dr. A.M. Northrup, secretary of Labor and Industry for the State of Pennsylvania.